The federal Pell Grant is a need-based award available to students pursuing their first bachelor's degree. Eligibility is based upon your EFC and enrollment status. You're automatically reviewed for the Pell Grant with receipt of your FAFSA. The annual maximum amount of the Pell Grant available is subject to change year-to-year by the Department of Education. See the Federal Student Aid for ranges and award amounts. 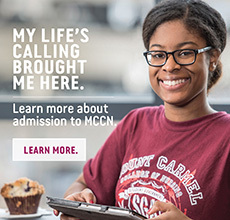 Federal Pell Grant recipients may be eligible to use award funds at the MCCN Online Book Store. At the start of each semester, Book Grants are available to eligible students. Eligible students are students who have a finalized financial aid award and who will have federal financial aid in excess of at least $100 above tuition and fee costs. To apply for a MCCN Federal Pell Book Grant, complete and return the following form to Financial Services: Federal PELL Book Grant Applicaton. The Federal SEOG Grant is a need-based award provided by the Department of Education. Students selected for SEOG will demonstrate significant financial need. You are automatically reviewed for the SEOG award when your financial aid award is being created. To be eligible for SEOG, you must have significant financial need as determined by your EFC, be registered for full time attendance and be an undergraduate student who is receiving the Pell Grant. The amount of SEOG funding Mount Carmel receives from the Department of Education is limited and subject to change year-to-year. Students that meet the FAFSA precedence filing deadline will receive precedence in awarding. The Ohio Board of Regents administers the Ohio College Opportunity Grant (OCOG) program, which provides grant money to Ohio residents who demonstrate the highest levels of financial need (as determined by the results of the Free Application for Federal Student Aid (FAFSA) that should be completed) who are enrolled at Ohio public university main campuses (not regional campuses or community colleges), Ohio private, non-profit colleges or universities, and Ohio private, for-profit institutions. Ohio residents in a degree or nurse diploma program at an eligible Ohio or Pennsylvania institution with an EFC (Expected Family Contribution) of 2190 or less and a maximum household income of $75,000. How much aid is available? All amounts reflect annual awards in $. Appropriate annual award amount should be divided by two for semesters or three for quarters. Eligible students continuously enrolled may receive an additional 1/2 or 1/3 of their respective award amount in their third semester or fourth quarter. Students are limited to 10 semesters or 15 quarters of state, need-based grant aid (including combination of OCOG and OIG). Students apply for OCOG benefits by completing the Free Application for Federal Student Aid (FAFSA). The application deadline is October 1 of each year. Campuses are required to follow the policy below regarding the Ohio College Opportunity Grant (OCOG) program in regards to refunds. If a student withdraws from the institution during an academic term the amount of the OCOG refund will be determined by the refund schedule of the institution. The total refund as a percent of the total instructional and general fees charged to the student shall constitute the percent of the OCOG award for the term which is to be refunded to the Ohio Board of Regents. For example, if a student withdraws and is entitled to a refund of 85 percent of the total instructional and general fees charged for the term, the institution must refund 85 percent of the student's OCOG allotment for the term to the Ohio Board of Regents. If a student withdraws and is entitled to a refund of 100 percent of the total instructional and general fees charged for the term, the institution must refund 100 percent of the student's OCOG allotment for the term to the Ohio Board of Regents. If a student reduces his or her enrollment to three-quarters time, one-half time, or less than half-time prior to an institutions census or "freeze" date, the OCOG allotment for the term must be reduced to the corresponding enrollment level. If a student drops below 12 credit hours after the institutions freeze date, but during the institutions refund period, the amount of the OCOG refund will be determined by the percentage reduction in the student’s actual fee charges. For example, if a student drops from 12 credit hours with tuition/fee charges of $450 to 8 credit hours with tuition/fee charges of $340, the tuition fee reduction would be $110 or 24 percent. Consequently, the institution would refund 24 percent of the student's OCOG allotment for that term to the Ohio Board of Regents. For more information see the OBR website.